A few hardy Tri logic runners braved the arctic wind and odd snowflake to run the 5 Tors organised by East Cornwall harriers today. A fast start saw the fittest & least dressed runners shoot off, spreading out the field very quickly. 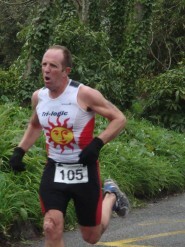 The challenging race was nearly 10 miles in length which took in Sharp Tor, Bearah Tor, Kilmar Tor, the Cheesewring and Tregarrick Tor. We descended to Siblyback reservoir before starting a slow ascent throught the marshlands around Great Gimble. Sunday arrived with all the wind and rain the recent forecasts had promised. This didn’t seem to put off team TLC, we pitted ten of our bravest/most foolish against the conditions and further members helped marshal or rode in from Praze to watch the show. Thanks to all for your support. I’m not sure what has been going on with the swim times but the second half of the field was heavily loaded with TLC members and the rest where liberally scattered through the earlier starters. This did mean at one point near Land’s End Airport there were three of us strung out along the airfield straight and one more not far behind. The ride was pretty exciting given the gusty conditions. Mark swapped out the deep section rims at the last minute; Darrin braved it out with his (despite much mickey taking) but did have a few scary moments passing gates near St. Just. We all got back to T2 safely and headed out on the run. In comparison to the ride, the run was sheltered, the only dodgy section being the short off-road section where the grass and mud was a little slippery. Weather aside, today was a great race and everybody seemed to have had fun, even if their times where not what they had hoped for (blame it on conditions, that’s my advise). As a team we did well, especially in some age groups. 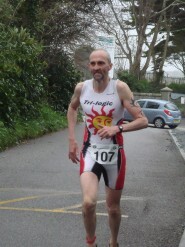 Mark won his age group (and ran off before we got chance to take a photo). Darrin came in 5th overall and 3rd in his age group. 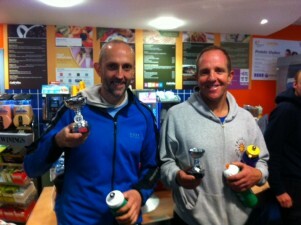 Phil came 3rd in his age group and Barry came in 2nd in his. Sarah also picked up a trophy as a novice. 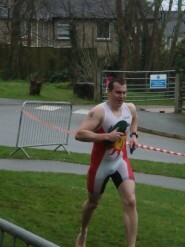 So not bad for the first race of the season, plenty of silver wear for the TLC trophy cabinet. As we’ve come to expect from Yvonne and crew the race was well organised and well marshalled. This has to have been the fullest goody bag for a while and there were nearly as many marshals as competitors. So a big thanks must go out to MBH and all the marshals. 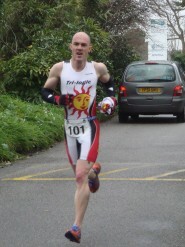 Jason Beever took the TLC club spot and achieved his goal of getting round in under four hours. 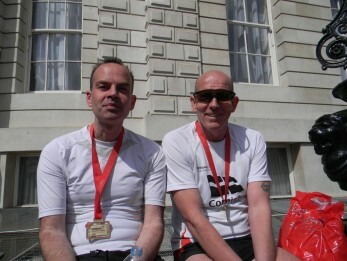 Our second claim members also did very well, Barrie was just seconds outside the magical three hour finish and Viv also came in well under four hours. 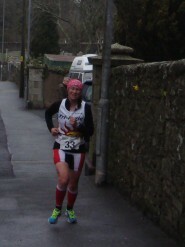 The ladies finished in fairly close order and Nicki finished off the pack. Congratulations to all of you, it was a hot and busy day and we are all very proud of you.